Cost Management from Visibility to Action. Manage and optimize your costs at scale. Gain insights and drive automation to reduce efficiency. Kumolus Cloud Cost Management and Optimization capabilities helps control cloud services-related spending by monitoring, reporting and making recommendations on your company’s AWS and Azure resource usage and computing demands. 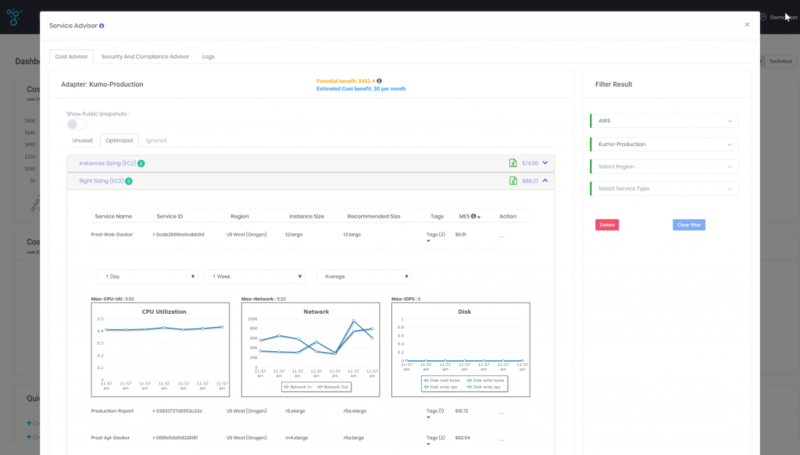 The Kumolus CMP focuses on monitoring cloud infrastructure usage, tracks spending as it relates to resource usage and identifies areas to save by reducing resource usage. Explore and analyse your billing & usage data to understand spending patterns, discover trends, identify budget overruns and highlight expenditure abnormalities. Share this cost & usage information with stakeholders so they have the insight necessary to adapt and manage their cloud usage accordingly. Whether supporting one or one hundred environments, Kumolus allows you the flexibility to break down your costs across the organisation as you need. The reporting tool provides for the creation of reports by account, team, application, environments or even down to identification of the highest cost service in your environment. Utilise Kumolus Service Advisor to identify unnecessary costs across your multi-cloud environments and quickly put a lense on the areas for review and remediation. Immediately reduce cost by decommissioning unconnected, idel or underutilised services. Remove the unnecessary analysis and guesswork from RI management. Understand the financial benefit and expiration status of any RI service. Automatically analyse your RI utilisation and determine underutilised RIs as well as RI conversion candidates with control points such as term, offering class and offering type. Are you services IDLE? or running at 25% utilization? is there a cheaper instance size available? Utilize Kumolus Service Adviser optimization for recommendations on your cloud services. Dynamically understand the cost of the template, environment or application you are building with real time cost update as you add AMI, Route, Subnet, EBS and other services. Restrict environment deployment by role and / or group based on budget allowance. Through custom tagging, every departments and team can be provided with visibility into their cloud usage allowing them to be responsible for their own costs. Easily expose API capability to integrate into Enterprise Billing systems and send customisable reports vias email and / or .csv to Finance teams, Technology Managers and Executive resources. 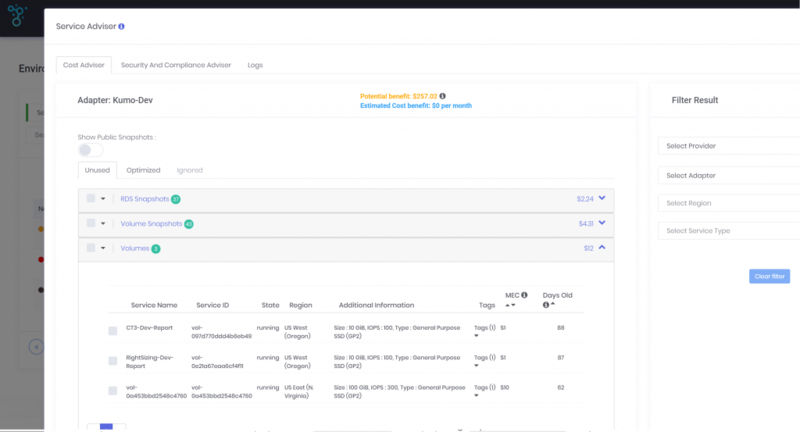 Drill down into the type of service RDS volumes, AMIs, Launch configurations plus many others and the detail of that service – Service Name, Service ID, Region, Tags the remediate the cost exposure. Immediate understand cost over-run by Cloud Service, Business Unit or DevOps team. © Kumo Holdings Pty Ltd. All rights reserved.